When God brought about the Reformation through Dr. Martin Luther, the followers of Luther called themselves “evangelicals,” that is the ones who preach the Good News of salvation by grace through faith in Jesus Christ, for Christ’s sake alone [apart from works]. “Lutheran” is what the Roman Catholic called the followers of Luther and in their thinking the word denoted a heresy. Lutherans were the followers of the heretic Luther. As the Reformation took shape, the evangelicals created documents setting forth the Bible’s teachings on disputed issues. In the wake of Luther’s death (Feb. 18, 1546), the evangelicals [Lutherans] began to argue amongst themselves. Confusion, dissensions and factions arose. In order to bring clarity to the issues now dividing the evangelicals, two theologians (Jakob Andreae and Martin Chemnitz) were given the task of collecting these major documents and writing any necessary supplemental documents and include them into one book of doctrinal agreement. That book became known as The Book of Concord (1580). 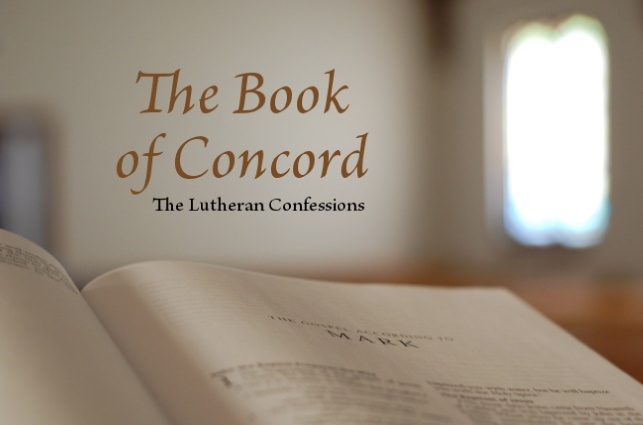 The Book of Concord never once uses the word Lutheran. Rather, Lutherans thought of themselves as evangelicals and that is the word The Book of Concord. The word “evangelical” was co-opted by many other groups; groups that did and do not accept the doctrines set forth in The Book of Concord and what was meant as a slur (“Lutheran”) eventually began a badge of honor and the name of those who accepted that The Book of Concord. The first 30 years of Lutheranism (1517-46) are the history of the Lutheran survival in the face of threats from Roman Catholicism and then Reformed theology. The Lutherans were tempted either to go back to Rome or to go forward to join Zwingli, Calvin, and the Reformed. The second 30 years (1546-77) are the history of dissensions. Perhaps the threats of the second 30 years were more serious because now the enemies of Lutheranism called themselves “Lutheran” too. The creation of The Book of Concord temporarily united the evangelical who accepted the Bible’s teachings on the Articles of Faith. More than 8,000 pastors and rulers signed and adopted The Book of Concord. Unfortunately unity did not last. doctrine and practices of various groups, all of which used the name Lutheran. The name “Lutheran” no longer signified an single body of doctrine based on the Bible alone. So an adjective was added– confessional. So What is a Confessional Lutheran?